My mom gave me a couple of cookbook author Maya Kaimal's Indian simmer sauces as a gift when she visited last week. I made the Tikka Masala tonight and it was unbelievably delicious. I'm not an Indian food expert, I just know I love it, and the Tikka Masala was zingy with lemon and silky from the real cream. I would definitely buy this and make this again. I used 4 chicken breasts and a couple of diced potatoes and it made enough for my family of four plus leftovers. I served it with fluffy basmati rice and sauteed asparagus on the side. Highly recommend, and the kids asked for thirds. Mmm - those are good - and one quick weeknight dinner! I love Indian - in fact Sundays are the day we hit the Indian/Pakastian brunch buffet! 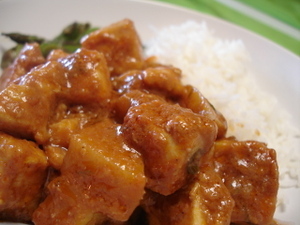 The last time I made tikka masala, I made my own sauce, and it was so easy that I will surely do it again. I heart Madhur Jaffrey's Indian food cookbooks. I made her tandoori chicken recipe last night- it was so easy. And baby ate almost 2 leg pieces! 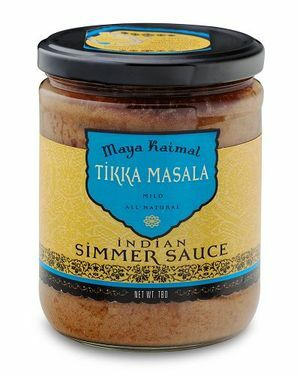 I know you don't love Trader Joe's as much as I do, but they sell a wonderful line of indian simmer sauces for insanely cheap (if I recall, around $2.30 for a 12oz jar). The korma is my favorite. So glad you loved our sauces. We also sell a line of 5 fresh (refrigerated section of your grocery) simmer sauces: Korma, tikka, vindaloo, tamarind and coconut curry. --much less expensive than Williams-Sonoma and really good. Thanks again - I love reading your blog.